Turns out guest-stars were as ubiquitous to Friends as Ross’s neurosis. To much whooping and audience applause, they played janitors and zookeepers and fake-British ex-roommates. Everyone remembers Brad Pitt playing Will Colbert, co-founder of Ross’s childhood “I Hate Rachel” club, but do you remember cameos by Jennifer Coolidge and Hugh Laurie and Charlie Sheen? Here’s a rundown of the strangest guest-stars on Friends — and, often, their even stranger plotlines. Do you remember a younger, pre-meltdown Charlie Sheen appearing as Ryan, an old boyfriend of Phoebe’s? She’s got the chicken pox, but Ryan tears off her Blanche veil and says that he wouldn’t even care if her face were covered in pox. They spend the rest of the episode scratching one another pornographically with everything from Monopoly dice to an oven mitt that looks like a cow. Hugh Laurie — i.e., “nameless passenger on a plane” — calls Rachel a “horrible, horrible person” in his exasperated British accent. Plus, adding insult to injury, he weighs in on the “big debate”: “It seems perfectly clear that you were on a break.” That’s the first and last we see of Hugh Laurie. Joey relaxes a little too much after “famous director Leonard Hayes” — a.k.a. guest-star Jeff Goldblum — casts him in his play. They hug, and Joey pees all over his leg. Oops. 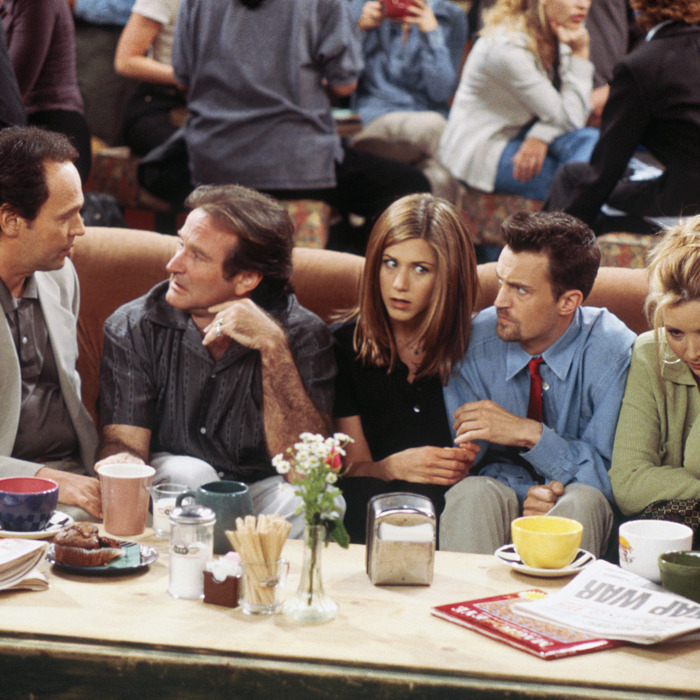 Robin Williams and Billy Crystal visit Central Perk in season three as Tomas and Tim. Tim is sleeping with Tomas’s wife, Tomas thinks his wife is sleeping with her gynecologist, and the whole thing is totally ad-libbed — including when Joey has the gall to interrupt their “private” conversation. I guess when Billy Crystal and Robin Williams want to guest-star (together!) on your show, you let them do whatever they want. Alec Baldwin is Zesty Parker, an overenthusiastic boyfriend of Phoebe’s who compares a traffic jam to the lights of a million fairies and whom Phoebe later compares to Santa Claus on Prozac at Disneyland getting laid. Nice. John “Spermtastic” Stamos, whose plotline also revolved around being very, very pretty. Monica and Chandler find out they can’t conceive, so Chandler brings Stamos home to be (unknowingly) vetted as a potential sperm donor. Rachel and Monica fight over the star of the movie — guest-star No. 3, Jean Claude Van Damme, and Rachel wins out. At least until Van Damme suggests a foursome with Monica and Drew Barrymore, who, unfortunately, is only on the set in name. And then Chandler runs into a childhood friend, “Susie Underpants,” a production assistant who also happens to be guest-star No. 4, Julia Roberts. She ends up leaving Chandler stranded in a bathroom wearing only a pink thong. We’d fill you in on the details, but it’s not worth it. Meanwhile, Joey goes on a date with a lunatic stalker who thinks that his Days of Our Lives character is real, and the stalker is guest-star No. 5: Brooke Shields. Last — and honestly, sort of least — Phoebe is hired to perform a children’s concert by none other than guest-star No. 6, Chris Isaak. She sings about grandparents dying, they do a “Smelly Cat” duet, and he kisses her. The Friends watch on, likely relieved the episode was finally over. Nine days down, 22 to go. See the rest of our Friends countdown here.